The annual series of thesis exhibitions and events represents work by graduating students from 16 of MICA’s 20 graduate programs. 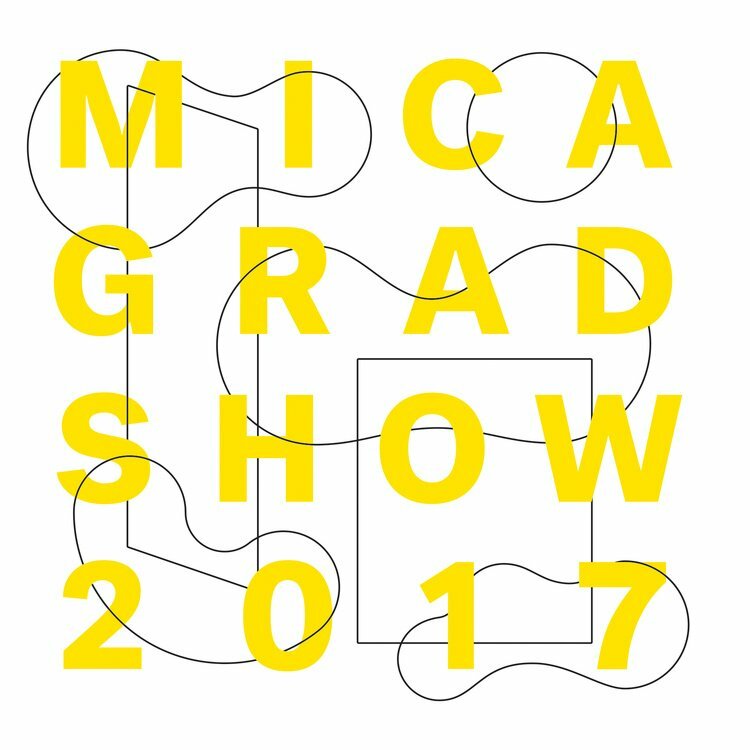 The Maryland Institute College of Art (MICA) presents the lineup for Grad Show 2017, the College’s annual spring exhibition and events series that features thesis projects and presentations from the next generation of creative thinkers, artists, designers, filmmakers, educators, curators and critics. Graduating students in 16 of MICA’s graduate programs will present their thesis projects in a series of exhibitions and critiques, gallery talks and presentations, public programs and talks, and student-curated installations at MICA and throughout Baltimore. "Grad Show is a showcase of cutting-edge work produced by emerging artists in our creative community. We are thrilled to expand our programming to include guest- and student-curated exhibitions, off-site gallery partnerships and work by the first Filmmaking class." said Erin Jakowski, associate dean of graduate studies at MICA. Doreen Bolger, former director of the Baltimore Museum of Art, will curate “Grad Show III” for the second straight year, with assistance from Baltimore-based artist Seth Adelsberger. “It is such a privilege to be working with students from five MICA graduate programs on their thesis exhibitions—so much talent and so much passion for what art can communicate in the twenty-first century! Seth and I are delighted to be a part of this incredible endeavor to present their work to the community—and to the world,” said Bolger. “Grad Show III” features student work from the LeRoy E. Hoffberger School of Painting, Rinehart School of Sculpture and Mount Royal School of Art, as well as the M.F.A. Community Arts and M.F.A. Photographic and Electronic Media programs. Other exhibitions and events include screenings from the inaugural M.F.A. Filmmaking class, an exhibition of work by M.F.A. Studio Art students and innovative design presentations by M.A. Social Design students. The M.A. Curatorial Practice program will also host a series of student-curated exhibitions throughout Baltimore and b eyond. For more information, visit micagradshow.com. WHERE: Riggs & Leidy Gallery, Fred Lazarus IV Center, 131 W North Ave. WHEN: Monday, March 27 – Sunday, April 9; Reception: Friday, March 31, 5 – 7 p.m.
WHERE: Fox Building, third floor, 1303 W Mount Royal Ave.
Riggs & Leidy Gallery, Fred Lazarus IV Center, 131 W North Ave.
Meyerhoff Gallery, Fox Building, 1303 W Mount Royal Ave.
Decker Gallery, Fox Building, 1303 W Mount Royal Ave.
Space Camp, 16 W North Ave.
Grad Show III: LeRoy E. Hoffberger School of Painting M.F.A., Rinehart School of Sculpture M.F.A., M.F.A. Community Arts, M.F.A. Photographic and Electronic Media and Mount Royal School of Art M.F.A. WHERE: Meyerhoff Gallery, Fox Building, 1303 W Mount Royal Ave.
Pinkard Gallery, Bunting Center, 1401 W Mount Royal Ave.
Current Gallery, 421 N Howard St. Le Mondo, 404 N Howard St.
WHERE: Sunday, April 2 – Sunday, April 30; Reception: Sunday, April 2, 4 – 6 p.m.
WHERE: Eubie Blake National Jazz Institute and Cultural Center, 847 N. Howard St.
Front is an augmented reality and online exhibition addressing issues of urban renewal by reimagining vacant storefronts throughout the Bromo Arts and Entertainment District. Curated by Betty Gonzales. WHEN: Saturday, April 1 – Ongoing; Reception: Friday, April 21, 7 – 10 p.m.
You Are Here is a socially engaged public art project that maps the multicultural story of the historically overlooked African American neighborhoods of central East Baltimore, while proposing the eastward expansion of the Baltimore City Heritage Area map. Curated by Yvonne Hardy-Phillips. Creative Alchemy highlights the intersection of imagination and science through a series of installations that link exploration and innovation with individual artistic visions. Curated by Carol R. Dyson. WHERE: Howard University, Interdisciplinary Research Building, 2201 Georgia Ave. NW, Washington D.C.
A symposium of peer-reviewed papers from students in the M.A. Critical Studies program and other schools. The symposium is devoted to the role that popular visual culture plays in shaping critical discourse. Select questions of inquiry include: What role do monuments play in forming public memory around historical events? How do adaptations of film, comics and other forms of popular art address classical themes, such as myth? How should artists respond to the growing shift in the digital delivery of art? WHEN: Saturday, April 22, 10 a.m. – 5 p.m.
WHERE: Lazarus Auditorium, Fred Lazarus IV Center, 131 W North Ave.
M.A. Social Design students present their interactive thesis projects. WHEN: Monday, April 24, 6 – 8 p.m.
WHERE: BBox, Gateway Building, 1601 W Mount Royal Ave. The inaugural M.F.A. Filmmaking class presents their thesis projects, including episodic pilots, narrative films and nonfiction programming. WHEN: Friday, April 28, 4 – 5 p.m.
WHERE: Falvey Hall, Brown Center, 1301 W Mount Royal Ave. Everyday Utopias explores imagined and realized aspects of civic participation, through the lens of a once-segregated pool in Baltimore's Druid Hill Park. The multimedia work on view navigates physical and spiritual spaces that dignify and cultivate hope over despair. Curated by Sheena M. Morrison. WHEN: Saturday, May 13 – Sunday, May 21; Reception: Saturday, May 13, 3 – 6 p.m. WHEN: Monday, July 24 – Friday, July 28; Reception: Friday, July 28, 5 – 7 p.m.
Fox 3 Gallery, Fox Building, 1303 W Mount Royal Ave.